Hannibal, MO – HLG held our 68th annual Booster Banquet on Friday, November 20, with the theme of “Expect a Miracle.” Over 600 guests were in attendance. This year’s banquet featured best-selling author, leader of various global and humanitarian causes, and media producer, Bruce Wilkinson. Author of over 60 books in 30 languages, he has been #1 in New York Times, #1 in the Wall Street Journal, and #1 in USA Today. His is the only book in history to win “Book of the Year” two years in a row. Publisher’s Weekly reported The Prayer of Jabez as the “fastest selling book of all time” (2001). The only religious non-fiction to hit the #1 New York Times best-seller list in the first week was Wilkinson’s A Life God Rewards. He has served on the Overview Committee of the New King James Version of the Bible, as well as the author of the Outlines of the Books of the Bible for the best-selling Open Bible, and is Executive Editor of three Bibles. Wilkinson is the author of The Prayer of Jabez, The Secrets of the Vine, A Life God Rewards, Beyond Jabez, Set Apart, Experiencing Spiritual Breakthroughs, and The DreamGiver. 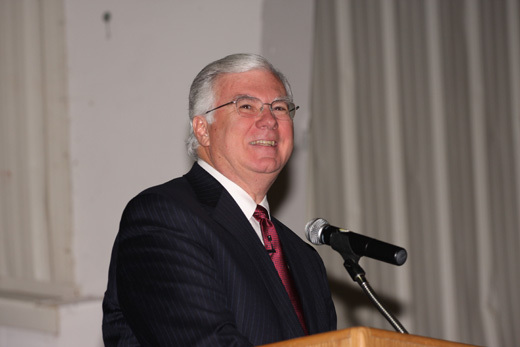 Dr. Wilkinson has built the largest seminar organization to the religious market in the world and has been the keynote speaker to President’s, CEO’s, Marriage and Family conferences and major national events. He launched Heart for Africa (previously Dream for Africa) which mobilized first-world volunteers who planted over 500,000 backyard vegetable gardens for the orphans and hungry. Wilkinson also launched the “Beat the Drum for AIDS” movement and recruited over 1,000 college students from eleven nations to conduct week-long AIDS training in every high school in the #1 HIV/AIDS nation in the world with dramatic results solidified by various local initiatives. At the request of the President of Kenya (President Moi), Dr. Wilkinson worked to produce the most award-winning motion picture on AIDS: Beat the Drum (28 awards), now in distribution in over 100 nations. He has been a featured guest on many major television and radio shows, and has been a keynote speaker on over a hundred internationally distributed video/TV sessions. He is currently working on a new major Hollywood motion picture. Wilkinson is married to Darlene with three children and six grandchildren. The Wilkinson’s reside in Atlanta, Georgia. “We have had some wonderful Booster Banquet speakers over the years, but I thought Bruce Wilkinson was one of the most inspiring speakers we have ever had,” said Dr. Burt. The evening also included performances by the Hannibal-LaGrange College Jazz Band and Concert Choir, and a book signing by Wilkinson.